DAY 1 Mid-Morning departure from George airport. (You may opt to have the vehicle delivered to your hotel). Your vehicle is a double cab 4x4 with air-con and GPS. Detailed maps, driving instructions and GPS co-ordinates will be supplied to you. Leaving George you begin your journey by traversing the scenic Montague pass. Continue on to your first destination which is Oudtshoorn. Here you may visit the Cango Wildlife Ranch. Touch a cheetah or dive with crocodiles if you have the courage. Continue on to the Cango Ostrich Ranch. Here you will learn all about this amazing bird. Catch a ride on the bird if you dare. Overnight at Buffelsdrift Private Game Reserve. Enjoy a game safari drive and dinner. Accommodation in a luxury Tented Camp. DAY 2 After breakfast depart for the Cango Caves for a tour of these magnificent underground caverns. 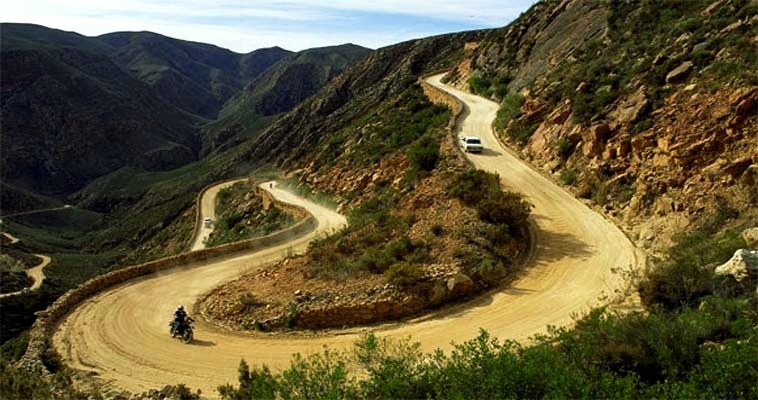 The trail then takes you over the spectacular Swartberg Pass. Expect to see snow in Winter. Enjoy lunch in Prince Albert. The journey continues on down the scenic Meirings Poort pass to De Rust. Here you will spend the night at the Die Gat Guest House. This farmstead and historic monument is situated in the valley of Middelplaas, near De Rust. Be sure to visit the village and take a donkey cart ride. DAY 3 The morning is spent driving on various private 4x4 trails on the farm. 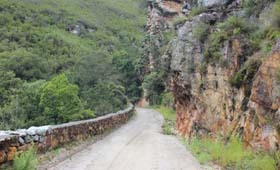 After lunch at De Rust you head over the Prince Alfred Pass. This spectacular pass, built in 1868, will mesmerize you with its awesome beauty. Be sure to stop for a refreshment break at Angies G spot in the middle of the mountain pass. Your next destination is the Plettenberg Bay Private Game Lodge. Accommodation at the Baroness Safari Lodge. dinner is included tonight. DAY 4 The morning starts off with a guided game drive and breakfast. Head down to Plettenberg Bay Beachfront. Enjoy a walk along Robberg Beach. Look out for whales and dolphins. The fresh seafood at the beachfront restaurants is excellent. After lunch take the back-roads to Kranshoek forest and the viewpoint. Here you are rewarded by magnificent coastal scenery. Take the Uniondale road to the Knysna Forest and visit the big tree - a giant Yellowood tree that is centuries old. A short drive will bring you to Knysna. Take a sunset cruise on the lagoon and enjoy dinner at the Knysna Quays Waterfront. Your last night at the wilderness trail will be at the award winning Knysna River Club. 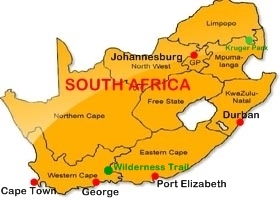 DAY 5 Drive down the Garden Route via Wilderness and George and return your vehicle at George Airport. 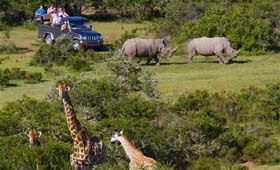 Included: 4x4 Double Cab vehicle rental, four nights accommodation with breakfasts. Dinners included on nights 1, 2 & 3. Two game drives. Entry fees to the Cango Caves, Cango Wildlife Ranch, Ostrich Show Farm and Knysna lagoon Cruise. Tourism levies and taxes. Not included: GPS rental, lunches, dinner on night 4, fuel. Some Travel Tips: During summer the temperature can reach 40� C during the day. During Winter it can drop to 0� at night so plan accordingly.